The former of home of Petaluma cheese maker Jefferson Thompson in the city’s D Street neighborhood. Perhaps best locally known for its concentration of handsome and historic homes, Petaluma’s D Street neighborhood also earns points with Sonoma County homebuyers for its excellent schools and proximity to the city’s thriving downtown. Located on the western side of the Petaluma River and about two miles from Highway 101, the neighborhood is roughly bounded by Western Street to the northwest, I Street to the east, and Sunnyslope Avenue to the south. Although many Petaluma residents who work in San Francisco commute by car, those who prefer the convenience of public transportation can take Golden Gate Transit’s 74 bus line, which offers weekday service to the city during peak commute hours from the Petaluma Depot at 4th and C streets. According to one of Pacific Union’s top Petaluma real estate professionals, homes in the D Street neighborhood count among the city’s oldest and grandest. A number of local properties have been designated as Heritage Homes by the nonprofit organization of the same name, which helps to preserve and restore buildings that have historic, architectural, or cultural importance to the city of Petaluma. One such property, an 1885 Italianate/Georgian-style home on Sunnyslope Avenue, hearkens back to Petaluma’s dairy-farm roots. Originally sited on 17 acres, the home was built for Jefferson Ashbury Thompson, founder of the Cheese Factory – now known as the Marin French Cheese Co. and celebrating its 150th anniversary this year, making it the oldest operating cheese company in the country. 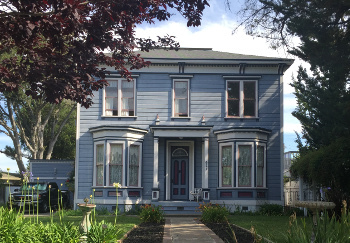 Heritage Homes, which holds biennial tours of significant Petaluma homes as well as an annual holiday tour, has distinguished a number of other structures in the D Street neighborhood, including the Sanderson Mansion at the corner of 6th and D streets and the Petaluma Historical Museum. According to the organization’s website, other Heritage Homes built in a variety of architectural styles can be found throughout the neighborhood, most of them constructed between the 1880s and early 1900s. AltThough D Street attracts Petaluma buyers who want to own a unique piece of Sonoma County history, it also appeals to families, thanks to top-rated schools. McNear Elementary School scored an 863 of a possible 1,000 on the 2013 California Academic Performance Index, and Grant Elementary School notched an 890. Located behind the elementary school, McNear Park offers families playgrounds, a recreation center, a community garden, and two swimming pools – handy for cooling off during the warm Sonoma County summers. Children will also enjoy visiting the nature exhibits at the Petaluma Wildlife & Natural Museum, the largest student-run museum in the U.S. Many D Street neighborhood residents are within walking distance of the city’s flourishing downtown, home to numerous of restaurants, shops, and art galleries. Nearby notable live-music venues include the Mystic Theater and the Phoenix Theater, which book nationally known acts that span a range of genres. According to our real estate professional there, prices in the neighborhood range from $550,000 for a two-bedroom, bungalow-style home built between 1870 and 1950, to more than $2 million for a much larger property from the same era.